The final two levels of classes at The French Culinary Institute take place in the kitchen of L'Ecole, FCI's restaurant. For someone like me who may never go on to work in a restaurant kitchen, it provides invaluable experience working the line and cooking food for paying customers. There is nothing quite like the feeling of finishing service on a Friday night, a busy one in particular, and knowing that all of your dishes went out on time and cooked perfectly (well almost perfectly?). It makes you feel like you can accomplish just about anything, at least, that's the way it made me feel. In both level 5 and level 6, you move through the different stations of the restaurant, cooking the meat dishes for four nights, fish for four nights, pastry for four, and so on. When you get to level 6, you get to spend four nights at the canapé station where the amuse bouche that precedes each meal is prepared. In most restaurants the amuse bouche serves as a way to use up excess ingredients while giving customers a little more than they are paying for. 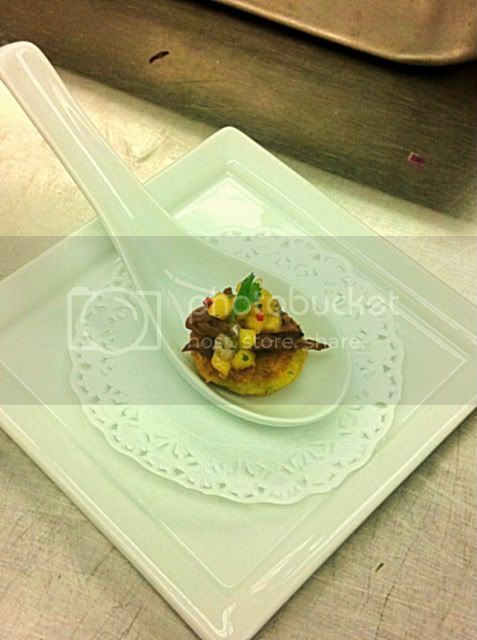 At FCI, it is up to the team working the canapé station to come up with and prepare the amuse each night. It is one of the few opportunities we get to be creative and to not follow any FCI issued recipes. It's a fun station. My team prepared the pictured canapé on a night when we were trying to use up some excess skirt steak. We braised the meat (not a usual treatment of skirt steak) and reduced the braising liquid to make a sauce to mix with the shredded meat. The base is a delicious corn cake recipe that my classmate Walter brought in for us to play with. I am providing the recipe for the corn cake below. The cakes would make a great side dish, or, if you have some leftover meat to use up, shred the meat, make mini corn cakes and impress your guests with your own amuse bouche before dinner. We topped the whole thing with a mango salsa - chopped mango, red onion and thai chili pepper. If the salsa gets too spicy, as it did in our case, you can temper it with some honey to tame the heat. Place the flour in a food processor with the egg, baking powder, coriander and half the corn. Pulse until coarsely chopped. Transfer the mixture to a bowl and stir the chili and the remaining corn. Heat enough oil to just cover a large, non-stick frying pan and drop in teaspoonfuls of the corn mixture. Fry for 1 minute each side, until golden, then drain on paper towels while you cook the rest. Arrange the corn cakes on a platter and top with leftover meat or a simple salsa. We served cute little corn cakes like this as an appetizer at our wedding! So fun to have a recipe to try to recreate them. What a cool experience. Are you nearly done? What do you plan to do when you're finished? Hope you'll continue to work in kitchens and keep us posted on what's up! Looks delicious, as usual. Congrats on your graduation- you must be thrilled! What do you plan to do with all your culinary knowledge and expertise now? Whatever itr is, I'm looking forward to reading about it... Kudo's again. Thanks for this recipe for corn cakes. Congratulations on your graduation. I love that they are spicy little corn cakes! I want to try them this week. They look so utterly delicious. Thanks for this corn cakes recipe. It sounds like a great treat for the summertime. These are so pretty! The corn cake recipe sounds delicious - love the flavour combinations with the steak and salsa.